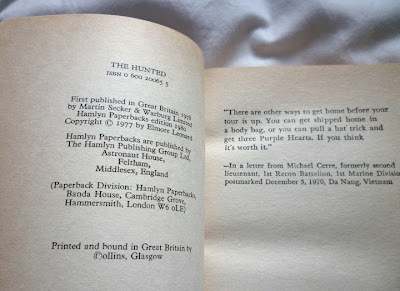 The Hunted, originally published in the States as a paperback by Dell in 1977. This isn't that edition, however – and nor is it the 1978 British Secker & Warburg hardback, which is so scarce I've never even seen its cover. No, this is the 1980 Hamlyn edition – the first British paperback edition, in other words – which, while not quite as uncommon as the Secker edition, is still in relatively short supply. 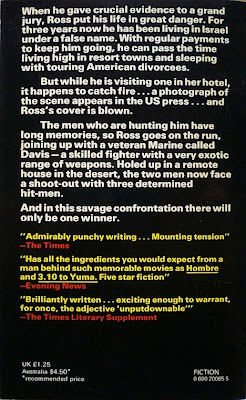 I bought this copy as a result of reading The Hunted as part of the Elmore Leonard omnibus Dutch Treat a few months back; I liked it so much I decided I needed an early edition of the novel by itself, this Hamlyn paperback, dodgy '80s glamour cover and all, being the best I could do (for now; I'll be keeping an eye out for a Dell or Secker edition). While The Hunted is on the surface a straightforward man-on-the-run tale, it's the story's locale which lends it its additional edge: Israel, with its history of conflict (the scars visible now and then in the narrative) and constricted geography. It's a tiny country, almost impossible to hide in, which makes it perfect for a game of cat and mouse between a trio of hitmen [Rashad, Teddy and Valenzuela] and a Federal witness businessman [Al Rosen] and his new Marine buddy [David Davis – no relation]. 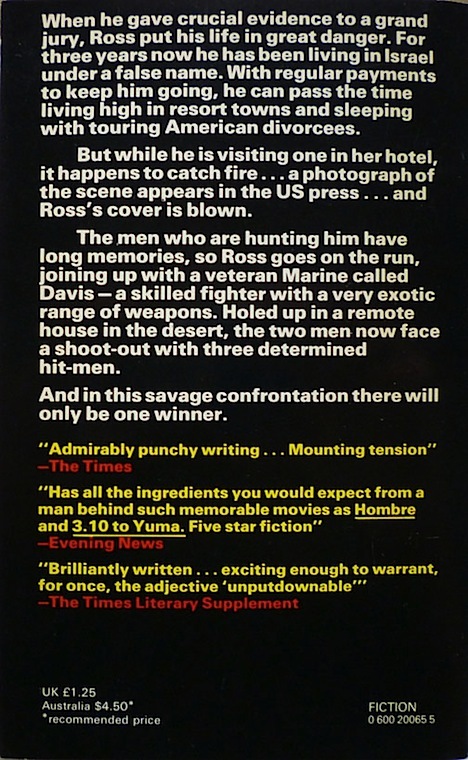 To which I'd add that you could, if you felt so inclined, make a useful comparison with the aforementioned Valdez is Coming, despite that novel being a western and The Hunted being contemporaneously set (as I mentioned in this post on the later Leonard novel Cuba Libre, Leonard started his career writing westerns, and an argument could be made that a number of his later crime novels and thrillers are westerns in all but name). To wit: both are wiry, linear thrillers, unencumbered by much in the way of plot (a good thing, in case you were wondering); both involve the pursuit of a pair of protagonists by a bunch of hired killers; and both climax with a tense standoff at a remote locale, although the standoff in The Hunted entails rather more bloodshed than the one in Valdez is Coming. I've really got to read more Leonard. I know I've nabbed enough to have plenty to choose from. Which ones have you got to choose from, Kelly? Oh, gosh, you're talking to a woman who has many thousands of books. I know I have a pile of the more recent trade paperbacks, and there's no telling what I've got as far as old mass markets -- I'll bring home anything vintage-y. I'll try to see what I've got soon and let you know.